The next little task for the scenario machine is the Battle of Lemnos in early (January) 1913. I am still trying to find a reference with a definitive date (by that, I mean one I can verify as off the Greek calender or the Gregorian one). The Naval Battle of Lemnos is a little naval battle from the Balkan Wars where Turkish and Greek vessels set to each other around Lemnos. I am away from my Conways at the moment but asking friends and acquaintances in a number of places, principally jim k from one of the Yahoo groups I subscribe to, I have managed to search out more information on these vessels. 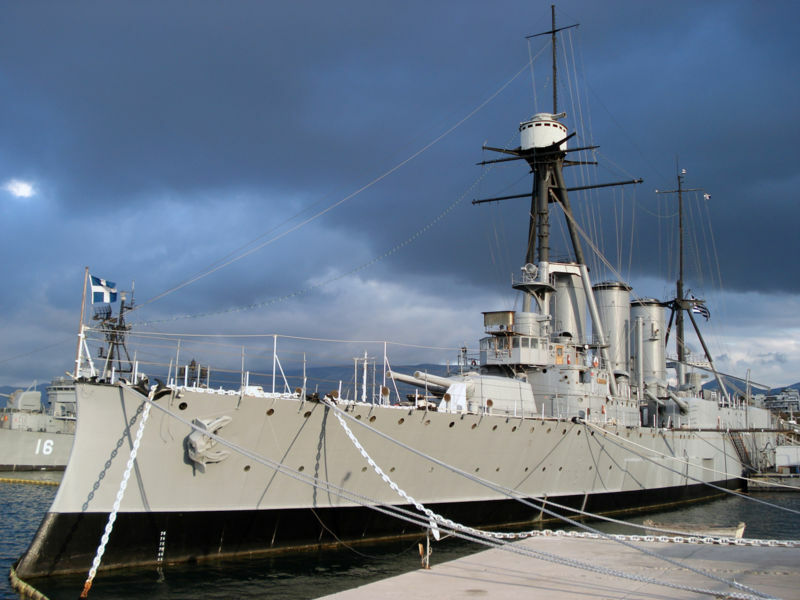 The Turkish battleship, Assar-i-Tevfik, remained in the Dardanelles and did not participate in the battle. On the matter of calender, January 5 Gregorian = January 18 on the Julian (Greek) Calender, hence the confusion. Around 08:20 in the morning of 5 January Greek patrols sighted the Ottoman fleet. The Greek fleet was signalled and accordingly made way from Moudros Bay at 09:45. About 20 kilometres south-east of Lemnos, the two fleets came within sight of each other, with both fleets, led by their flagships, sailing on a south-easterly heading. The columns were converging. At 11:34 at a distance between the columns of 8400 metres the fleets opened fire on each other. The Greek fleet (to the west of the Ottomans) turned to port to close the distance further. Just before 11:50, the Medjidye and the Ottoman destroyers turned sharply to port onto a new heading of north-east, steaming towards the Dardanelles. At 11:50 the Mesudiye also turned to port following. It had suffered heavy damage from combined fire from Hydra and Psara. 11:54 and the Averof is firing on the Barbaros. A straddle and the Barbaros‘ middle tower is destroyed. The Barbaros joins the other Turkish vessels heading back to the Dardanelles. Turgut Reis turned in company and sailed with the Barbaros. The Averof had superior speed to the other vessels so commenced manoeuvring to use the guns on either side of it against the retreating Turkish vessels. The older Greek ships pursued as quickly and as best they could. The pursuit was called off at 14:30 as the Turkish vessels neared the Dardanelles. The Turkish vessels managed to keep up a brisk rate of fire, firing around 800 shells during the battle, However many of them (well all right, most of them) actually failed to hit. The Greek firing was considerably more effective. The Averof received two hits, suffering one injury and minor damage. The other Greek battleships escaped unscathed. The Turkish vessels suffered more. 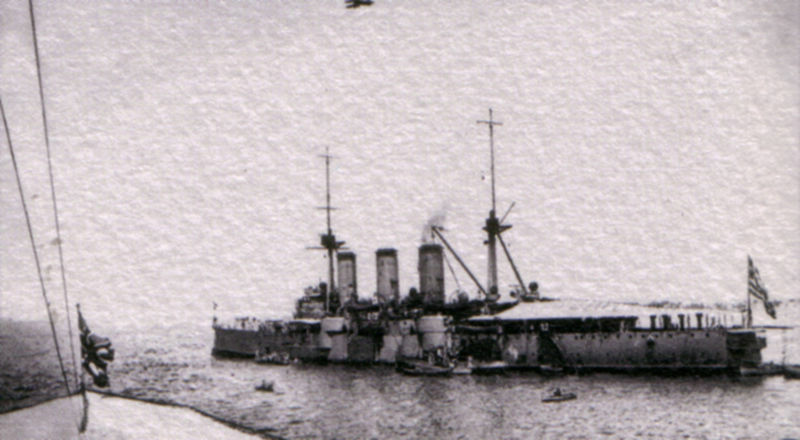 Barbaros was hit by over 20 shells destroying most of its guns and killing 75, wounding 130 crew. Turgut Reis suffered a major leak from 17 hits and 47 casualties. Mesudiye also suffered several hits. However Mesudiye‘s central gun platform was hit by a 10.8-inch shell, causing 68 casualties and destroying the 6-inch gun platform. The result of this battle was that the Ottoman fleet did not venture forth from the Dardanelles again in the Balkan Wars, leaving the Greek fleet the master of its little part of the Aegean Sea. Two fleets roughly parallel and approximately 9000 metres (scale) apart, steaming on the same heading is a good starting point for this. I cannot tell if the destroyers did anything other than hang around out of range but they do provide an interesting addition to the battle. Many of the ships for this Battle are available in 1/3000th scale from Navwar so it is possible to recreate this battle on the table top. All codes shown below and packet names are from the Navwar catalogue which is downloadable online from http://www.navwar.co.uk/. These vessels were launched in 1899 and displaced 4,808 tons. Their speed was 17 knots and they were armed with 3 x 10.8″ guns, 5 x 5.9″ guns, 4 x 3.4″ guns as well as 3 x 14″ Torpedo Tubes. 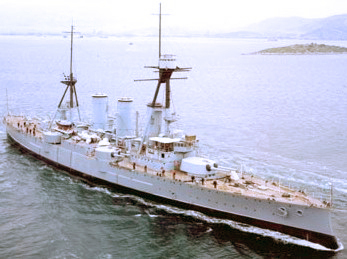 The Giorgios Averoff was completed 1911. Its displacement was 10,118 tons and it could maintain a top speed of 22 ½ knots. Its armament was 4 x 9.2″ guns, 8 x 7.5″ guns, 16 x 12 pdr and 3 x 18″ Torpedo Tubes. With regards to the Greek destroyers, I have not been able to find definitive details of which vessels were present. There were supposed to be 7 destroyers present, so 4 of them can come from the Aetos Class. Certainly some of these were present. Vessels are the Aetos, Ierax, Panther and Leon. N8754 – AETOS CLASS (containing 2 vessels). N8P10A – MESUDIYE (containing 1 vessel). The Mesudiye was a Turkish Central Battery ironclad completed in 1875 and rebuilt in 1903 in Genoa. It displaced 9,030 tons and could achieve a speed of 17 knots. Armament was 2 x 9.2”40 cal breech-loading guns, 12 x 6” guns, 14 x 3” guns, 2 x 47mm guns and 10 x 57mm guns. The Barbaros Hayreddin and Turgut Reis were purchased from Germany. They were two of the old Worth class battleships sold to Turkey. These vessels were originally completed in 1893. Displacement was 10,060 tons and armament was 4 x 11″ 40 cal guns, 2 x 11″ 35 cal guns, 8 x 4.1″ guns and 8 x 15.5 pdr guns. There were also 3 x 17.7″ Torpedo Tubes. Vessels could reach a speed of 17 knots. The cruiser Medjdiye was originally built in the USA. N8P33 – HAMIDIEH and N8P33A MECIDIYE (Medjdiye). These vessels come in the same pack. We are only interested here in the Medjdiye. It was a Turkish cruiser completed in 1903 and displacing 3,485 tons with a top speed of 22 knots. Armament was 2 x 6” guns, 8 x 4.7” guns, 6 x 3-pdrs and 2 x 18” Torpedo Tubes. This class of 8 destroyers built for the German Navy was completed in 1910 to 11 and numbered S165-S168 and S176-S179. The group numbered S165-168 were sold to Turkey in 1910. They displaced 665 tons and were armed with 2 x 8.8 cm guns (around 3.5-inch) and 3 x 17.7” torpedo tubes. They could reach a top speed of 32 knots. I forgot to note that the pictures were taken from a couple of places on the Internet, including Wikipedia and all are either out of copyright or placed in the public domain under a GPL. I know I don´t include a source, but I have read that the greeks' destroyers were listed as "scouters" or explorers, since the lacked torpedoes. Why did they lack torpedoes, you migth ask? Well, because the greeks didn't have the money to buy them. On the other hand, Koundouriotis had insisted on making the crews under his command to trainning almost constantly; the otoman fleet, due to political reasons, was unprepared. Even if the greeks -again, due to lack of fund (a constant in greek modern history) bought the basic amount of shells for the Averof, the permanent trainning of the crew paid off. it is true that the “Aetos” class lacked torpedoes due to lack of funds. However, “Georgios Averoff” had only the basic load of ammo for her guns, because the British refused to provide the full load of shells to the Greeks, claiming strict neutrality, since the first Balkan war had already been declared. The much needed ammo arrived and was loaded to the cruiser a mere 15 days before the battle of Elli, thanks to a Greek tycoon (another constant in Greek history perhaps !) and arms dealer named Basil Zacharov, who pulled a few strings in the British political lobbies (and, as rumors have it, pushed a few pounds under certain tables) and managed to have the precious 9.2″ shells loaded in two Greek merchand vessels, just in the nick of time. Another point about the Ottoman order of battle is that the 4 French built Samsun class destroyers, were suffering from a chronic lack of maintenance, so they probably didn’t take part in the battle. My sources mention only the 4 S-165 destroyers in the Ottoman OOB. Thanks for the comment – I’m always happy to get updates. I was unaware of the ammunition issues of the _Georgios Averoff_. Fantastic article, and enhanced by the other comments. Curious to hear about what rules you used, and how you are basing your ships. I must find the vessels next time I am at my mother’s. Rules used are generally General Quarters – Fleet Action Imminent. As World War 1 rules they are close enough for 1913 and give a good game with flow. The only difficult part is getting the gunnery charts together for these vessels – I must check the ODGW website/forum soon and see if someone has done the hard work already. As for basing, I use 3mm thick bases that are slightly larger than the vessels. Some fake sea can be added by using Woodland Scenics Flex Paste and then the ship is pushed into this. Paint and play after that. The reason I use a 3mm thick base is so that I can put the ships name on the side where it is visible to all playing.